This review represents the installation with its isofix base but it can also be installed with seat belt. Cybex Cloud Q is among the safest baby seats having a ‘very safe’ mark, being the only one that got ‘very good’ in the 0+ category in 2015. It is a bit heavier with its 5.6 kilos compared with for example Aton Q‘s 5.1 kg or Aton M‘s 4.8 kg. Cloud Q has been designed and engineered in Germany. Inside the car an almost lie-flat position can be made for little babies, while outside a total lie-flat position is possible, and as such, the seat can replace the carry-cot with its function – and you do not even have to take out the baby of the carrier to transform the seat into this flat-lie position thanks to its longer leg-rest and reclining backrest. It can also be used as a carrier and a travel system on several buggies and strollers (e.g. Cybex, gb) with an adapter. Cloud Q cannot be used on airplanes. A central adjuster helps to adapt the size and height of the harness and headrest to the baby and they can be adjusted simultaneously. 11 different height positions are available. The Telescopic Linear Side-impact Protection (L.S.P. System) protects the baby from a possible side impact by absorbing and channeling away the energy with its flexible material. You have to open the Linear Side-impact Protection on the side that is closer to the door. In case, you place the seat in the middle of the rear seats, you must not unfold the Linear Side-impact Protection. Additionally, you can buy a footmuff, rain and summer cover, insect net. Isofix guides matching with the Cloud Q seat (if you choose to buy the seat with its base) are also available. 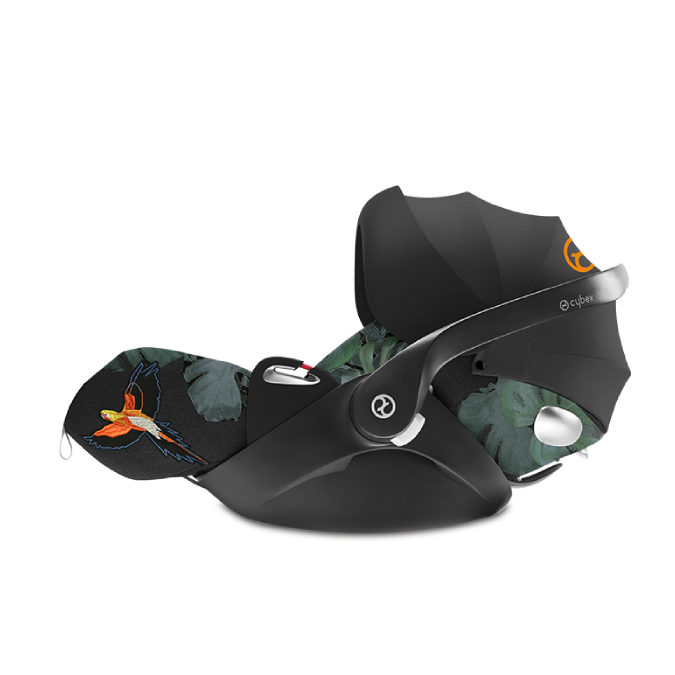 There are two different types of inlay materials available for Cybex Cloud Q. One of them is a soft and cozy comfort style. The other one is the Plus version which looks like denim with a twill effect and is exclusive and a very hard-wearing fabric. 2 by Jeremie Scott: very different from the previous ones. I am not 100% sure if those creatures are supposed to be anime figures, super heroes or angels – or probably all of them are there. I am happy to hear your opinion in this in the comments. I hope you liked this review and if you have any question about the Cybex Cloud Q seat with its base or want to leave your own personal experience, leave a comment below.